What is drop shipping? Drop shipping is a way to sell physical products without having a storefront or having to buy inventory in bulk but still getting a wholesale price from your supplier. Drop shippers can sell everything from t-shirts to TVs. Traditional, brick and mortar retailers, like Best Buy, have stores that they fill with inventory. They buy the inventory in bulk from suppliers, say 10,000 TVs from Sony. In exchange for buying the products in bulk, suppliers charge retailers a lower, wholesale price, say $400 per TV. Retailers make their money by marking up those products before selling them to their customers. Best Buy sells the TV they bought from Sony for $400 to their customer for $750. Best Buy just made $350. If you already have a product you’re looking to sell online, it might make more sense to look for fulfillment services. Click on the button below to get free quotes from multiple providers through FulfillmentCompanies.net. Drop shippers also sell a physical product to their customer, again, lets say it’s a $750 TV. And they’ve also marked up the price from the wholesale price they paid to their supplier, again, we’ll say it’s $400. The drop shipper just made $350. But here’s the difference, the drop shipper didn’t buy 10,000 TVs from the supplier – they bought one. This begs the question, if drop shippers don’t buy their inventory in bulk like Best Buy, how can they get wholesale prices like Best Buy? Why Do Suppliers Give Drop Shippers a Special Deal? Here’s the trick: suppliers offer the drop shipper such a special deal because the supplier isn’t a name brand – they aren’t Sony. A supplier with a popular brand, like Sony, can demand that retailers buy their product in bulk. Traditional retailers will agree because they know Sony products have regular customers and the products will sell. Sony’s brand makes their products safe for retailers to buy in bulk so Sony doesn’t need to make special deals with drop shippers. But what about an unknown brand, like SuperDuperFuture TVs? They aren’t a name brand so traditional retailers don’t know if customers will buy their products. If a retailer doesn’t know if a brand will sell, they are unlikely to risk buying a bunch of it in bulk. Without traditional retailers to buy their products in bulk, SuperDuperFuture TVs will be more likely to make special deals with drop shippers. This isn’t a one sided deal though! With a good drop shipping partner, the supplier doesn’t have to spend a fortune on marketing trying to develop a brand before selling their products. Drop shippers are experts at marketing, sales, and customer service. So by making a deal with a drop shipper the supplier gains access to a retailer who can successfully introduce their brand to customers. For a customer, drop shipping feels like any other online retail transaction. For example: Barbara goes to BigScreenPros.com, buys a TV, and the TV is shipped to her. Barbara is happy. In actuality, Barbara goes to BigScreenPros.com and buys a TV. But BigScreenPros.com is a drop shipper who doesn’t actually have any inventory to ship to Barbara. So BigScreenPros.com places a duplicate order with their supplier, SuperDuperFuture TVs. SuperDuperFuture TVs receives that order and ships the TV to Barbara. Barbara is happy. The drop shipper never sees or handles the product. The supplier never sees or deals with the customer. The customer has no idea that two different companies were involved in her shopping experience. What the customer does know is the BigScreenPros.com is a great place to buy TVs and that SuperDuperFuture TVs makes a great TV. The next time Barbara needs a TV she will have both of those brands in mind. A common challenge when it comes to dropshipping is finding the right products to sell. Oberlo is a dropshipping platform that allows you to easily find and add quality products to your Shopify store. It has a vetted network of suppliers that take care of your inventory, packaging, and shipping for you. Click here to start a free 14 day trial — no credit card required. Customer places an order on drop shipper’s site. Drop shipper places an identical order with their supplier. The supplier ships the product directly to the customer. If you already have a product, you’re probably looking for a fulfillment provider, not a drop shipping service. Click here to get free quotes from multiple fulfillment providers. 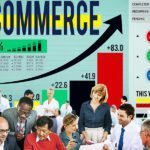 Does Drop Shipping Have a Future? Drop Shipping and E-commerce make up a steadily growing portion of total US retail sales. According to the most recent quarterly report by the US Census, total E-commerce sales for 2015 over $341 billion. That’s an increase 14.5% from 2014. There are many profitable drop shipping businesses out there. There are even some that have grown to be hugely successful companies like Zappos, Wayfair.com, Fab, and Gilt Groupe. Having said that, as with any business, profitability will depend on many factors. The two things that most impact how much money a drop shipper makes is the margins on their product and their conversion rates. Margins are the difference between what a drop shipper pay their supplier for the product and what the charge the customer. Conversion rates are the number of people that visit your store vs. the number of people that end up making a purchase. For example, if I sell SuperDuperFuture TVs for $1000 I would expect to make $200 on each sale. And if I have 1,000 people visit my site per month, then I would estimate that 20 of those people will buy my product. If I made $200 per sale and had 20 sales, I have made $4,000. Drop shippers increase their profits by finding higher margin products and increasing their conversion rates. In my next article, I will tell you how to find higher margin products by developing a focused Niche and finding Top Tier Suppliers. I will also discuss the keys to higher conversion rates. If you would like some insight into the pros and cons of drop shipping take a look at this article. Summary: What Is Drop Shipping? Drop shipping is a steadily growing industry that requires little initial capital investment from those entrepreneurs looking to enter the retail space. That said, it is a competitive industry. Drop shippers that have expertise in online marketing, sales, and customer service will have an advantage over those who do not. Drop shippers must be comfortable selling less well know brands and products. Ready to get started? Go ahead and check out our complete guide on How to Start a Drop Shipping Business. Great article! Do you have any suggestions on what price margins to be expecting/negotiating for on a drop shipping item with retail price $500-$1500? Oh, there are so many factors that affect drop ship pricing that it’s really hard to state a general rule of thumb. Some sellers of high-value goods are thrilled to get a 30% – 40% gross margin and as low as a 20% net margin (after shipping and vendor account costs are factored in). Shipping costs, demand, and competition, all play into the pricing. In drop shipping, you’re unlikely to get the 50%+ gross margins that a seller stocking and shipping items themselves (and covering warehouse expenses) shoots for. I hope this gives you some idea of what you might expect. Good luck! Hi, I am new to drop shipping. This was very straight forward and helpful. Glad to be of help. Thanks for reading and good luck with your drop shipping venture. We’ll be updating this one soon with fresh information. In the meantime, you might want to learn about print-on-demand dropshipping which lets you offer customized products, from t-shirts and mugs to totes, apparel, and even household decor to your customers via a drop-ship process. Our How to Start a Print-on-Demand T-shirt Business article to learn more about this drop-ship opportunity. Hope this helps, good luck! Another great piece to add to my dropshipping resource list,thanks for the valued infromation you keep on sharing with us the young dropshippers who aspire to be successful one of these fine days. Thank you for reading! Good luck in the new year! Thanks for the article! One of the most helpful on the subject of drop shipping. One question, though… where did you come up with your figures? I mean, why do you say you can expect a 20% margin and 2% conversion rate? A 2% conversion rate is a reported average across the eCommerce industry. On average, about 2% of a site’s browsers actually make a purchase during their visit. Of course, businesses like Amazon have higher conversions due to being destination shopping sites. People go there for the express purpose of buying something, so they get fewer tire-kickers than small sellers. For the 20% margin, again, that’s an average margin for a reseller using a dropship supplier. Some suppliers and products may offer a higher margin, some can be lower. Dropship suppliers bear the cost of sourcing, storing, packaging, and shipping products for their dropship sellers. Those elements all add up in the overall cost and affect the profit margin. If you run a cost comparison using your own sourcing costs, storage, and fulfillment (staffing, packing material costs, etc. ), you might be surprised that a 20% net operating margin can be hard to meet.